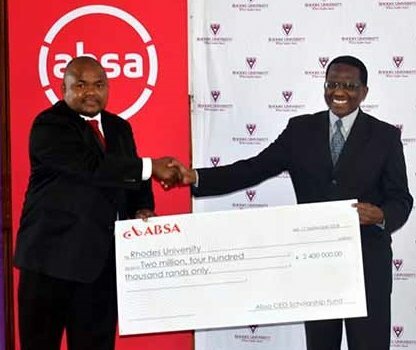 ABSA recently handed over a cheque of R2.4million to Rhodes University from its CEO scholarship programme for the 2018 academic year. Absa’s funding will extend to a group of carefully-selected, academically deserving Rhodes University students for the entire year of 2018, in the following academic fields: Commerce, Humanities, Engineering, Science, Art and Technology. The scholarships are granted on academic merit and the primary focus at Rhodes has been to assist students in the missing middle group. During the handover ceremony, the Absa team encouraged students to use this opportunity to contribute to the greater good of humanity. The scholarships will support 49 students with full tuition, as well as residence expenses in some instances. 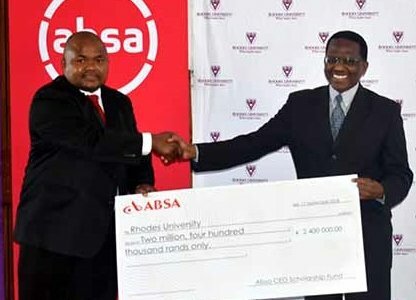 Vice Chancellor Dr Sizwe Mabizela and Deputy Vice Chancellor of Research Dr Peter Clayton were present at the ceremony to receive the scholarship cheque. In the past two years, Absa has funded over 6500 university scholarships for young people across Africa. Twenty-one universities in South Africa are being supported, including Rhodes University. Absa’s commitment to education includes a study loan scheme and a free youth banking product, which responds to the broader development needs of financial inclusion. One of the bursary recipients, Ms Thamaga, thanked Absa on behalf of all the bursary students. She said, “Having met other bursary recipients, I realise what impact this opportunity has not only for us to obtain our degrees, but for us achieving our goals and dreams.” She hopes to increase the participation of women in sport through her love of sport and television.